Amiable and easygoing he may be, but Noonan is no soft touch. Just ask Marty Becker, his opposite number at the company now known as Alterra. In 2009, when Alterra was still Max Capital, the two locked horns over the purchase of catastrophe specialist IPC. The battle was bitter and drawn out. Not only did Noonan disrupt what looked like a done deal for Max by putting in an unsolicited counter-bid for IPC in March of that year, he sued both Max and IPC in April when IPC rejected Validus’s offer, challenging a $50m termination fee in Max’s initial merger agreement. He also upped the Validus offer several times over the four months it took to secure an agreement. Noonan’s tough tactics paid off and Validus succeeded in striking a deal with IPC in July for $7.50 cash and 0.9727 Validus shares for each IPC share, also beating off a last minute challenge from fellow class-of-2005 reinsurer Flagstone Re. Validus said at the time that the $31.73 a share paid was a 24.9% premium to IPC’s share price before it made its initial offer. The deal finally closed on 4 September 2009. Noonan describes the fight to buy IPC as “gentlemanly, if a bit rugged”. Now the deal has had 18 months to bed in, and the company has reported its first full-year results as a combined entity, has IPC proven to be worth the estimated $1.7bn and not inconsiderable effort to buy it? And with the soft market looming and rumours swirling that Validus is seeking further takeover targets, where does Noonan take the company, and indeed his own career, now? For Noonan, winning IPC was a resounding success. “It has been a home run on several different levels,” he says. While Validus paid a premium to IPC’s share price, Validus snagged the company at a discount to net tangible assets. The result was a $287.1m one-off gain booked in Validus’s 2009 results. “It’s not that easy to make $300m in a single day, but we were able to do that with the acquisition of IPC,” Noonan says. Shareholders were also happy: IPC’s owners were paid a dividend of $400m on completion of the deal. Validus has also bought back $947.2m of its own stock since the deal completed. 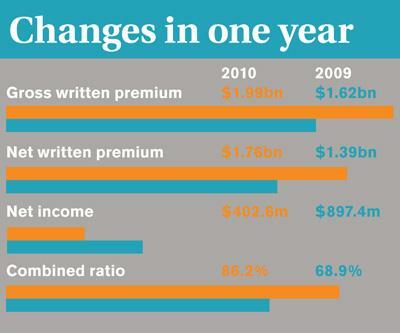 Best of all for Noonan, however, was how the enlarged firm was received by the property-catastrophe reinsurance market. Individually, Validus and IPC had shareholders’ equity of $2bn and $1.8bn, respectively. Following the combination, return of capital and buy-backs, the combined entity now has shareholders’ equity of $3.5bn. 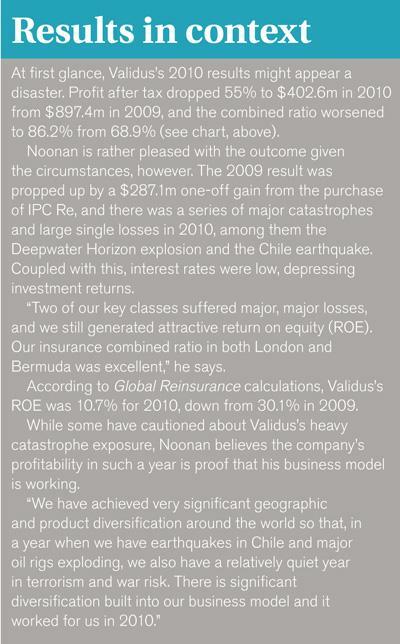 In particular, IPC expanded Validus’s footprint considerably in the European catastrophe market. Not even rating agency and analyst gripes have been enough to take the shine off the IPC deal. AM Best, for example, expressed concerns that combining two property-catastrophe heavy companies like IPC and Validus would create a concentration of risk and put Validus’s A- rating under review, with negative implications. But Noonan asserts that the combined entity has kept its catastrophe exposures in check. He says that the company does not allow its one-in-100-year probable maximum loss expectation from catastrophes to exceed 25% of capital. Before the IPC acquisition, it was 21%, and it still is. “I think that concern has been disproven,” he says. The IPC acquisition added to Validus’s 2007 purchase of Lloyd’s insurer Talbot, which added insurance business to its portfolio as well as several new classes of business. Since that acquisition, Validus Holdings has had two operating units: Validus Re, which writes purely reinsurance from Bermuda, and Talbot. He argues that Talbot is in a similar situation, although there are strong rate increases in areas such as marine liability and offshore energy following the Deepwater Horizon oil rig explosion, and war and terrorism following the recent Middle East unrest. One area that Validus is likely to shun in particular is US long-tail liability. Noonan knows from bitter experience how challenging this line can be. Aside from running Validus since inception in 2005, Noonan is perhaps best known in the market for his time at American Re, a New Jersey-based reinsurance group that was bought by Munich Re in 1996 and is now known as Munich Re America. The truth hit home in the soft market of 1997 to 2001 when American Re, along with several of its peers, was hit hard by severe US casualty losses, in particular from old asbestos-related claims. There are, however, future growth opportunities to be considered. Noonan says his company is under-represented in the USA in general: the company writes US-exposed catastrophe business but does little else. Assuming the right market conditions, Noonan would be open to setting up a US platform, either from scratch or through acquisition. Other areas where Noonan is open to making acquisitions are the growth hotspots of Asia and Latin America. Talbot has a presence in the Lloyd’s Singapore platform, and Validus Re has an Asian representative office in Singapore. Validus Re also writes Latin American risks from its offices in Miami and Santiago. “The growth of the global economy for the rest of our lifetimes is going to take place disproportionately in Asia and Latin America,” Noonan says. Following its success with IPC Re, rumours have surfaced that Validus might try to buy another of its Bermudian peers, this time Ariel Re. News reports have suggested the two companies are in advanced talks. Noonan declined to comment, but conceded that further consolidation among Bermuda’s reinsurers would make sense. With Validus proving resilient to catastrophe losses and a force to be reckoned within the global catastrophe reinsurance market, might it be time for Noonan to look for another challenge? He says there is plenty going on at the company to keep him interested for some time yet.